We are beginning Unit 2 by watching three movie clips and analyzing them using Feminist, Marxist and Archetypal Criticism. Then we are further examining ARCHETYPES by making posters that exploring some major universal images, patterns and characters. YOU MUST INSTALL THE PONDER EXTENSION IN CHROME TO GET THIS TO WORK! The directions are in the previous link. 2. USE THE LINK below to get started by registering for my class - you will then be able to find the class readings there. DIRECTIONS: Using the Ponder Extension, read the article assigned to your group and mark up the text. Provide COMMENTS with explanation where you can, and tag the parts of the ARGUMENT (Thesis, claim, evidence, etc) as well as the PRO vs CON of the argument. These three lessons are preparing students for reading Pygmalion, by George Bernard Shaw. The PowerPoint to the right (My_Fair_Lady.pptx) contains the movie stills for analysis. The culminating writing assignment is to write your own scene/dialogue. --Life-Size (watch only the first 2 -3 minutes or so)- In this film, the woman played by Tyra Banks is a Barbie Doll come to life. Watch as she tries to adapt to life in an office. --Splash (Watch from 43 min to 50 min- the sound is terrible)- In this film, the woman played by Darryl Hannah is a mermaid trying to adapt to life on land. —Think of a social blunder you or someone you know has committed. Turn in on TURNITIN.com within 48 hours. After viewing the presentation, read the "Check Your Understanding" on the bottom of page 104. 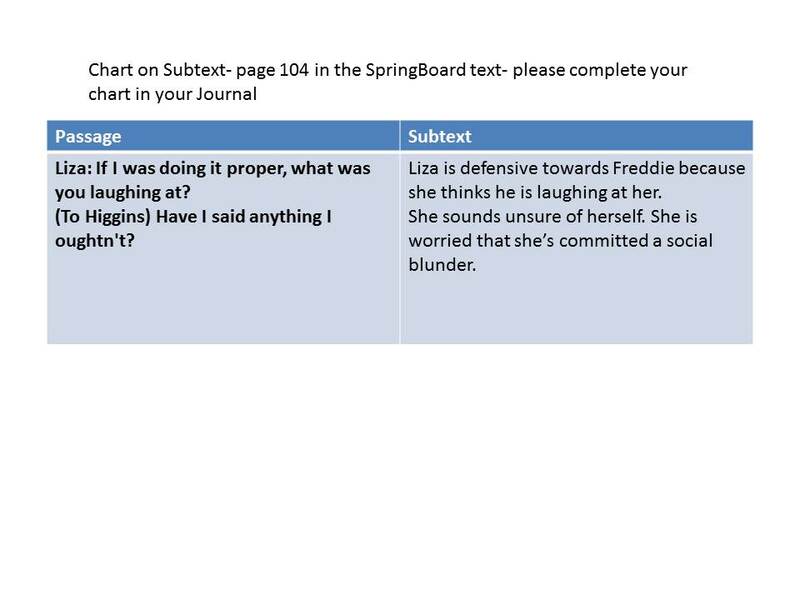 Create a two column chart and find a passage that would be interesting to interpret the subtext. Don't forget to mark the lines where you would want the actor to emphasize words, tone of voice, etc. Write a scene with three characters, Eliza, Pickering and Higgins. They are talking about what happened at the garden party/ball. ​Write a Position paper on WHAT SHOULD ELIZA DO NEXT? Write a dialogue with a partner. Choose a scene from the Epilogue and create a scene based on Shaw's version of events. Create a Diagram of the Hierarchy of characters through a Marxist Lens. Use Draw.io, which you can add to your google.docs account.